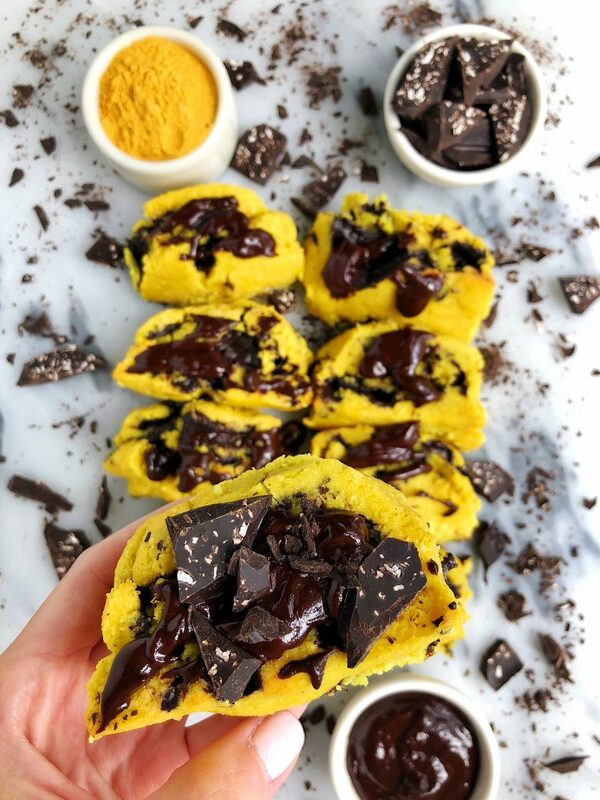 Paleo Golden Cinnamon Rolls with Chocolate Filling made with all gluten-free ingredients and anti-inflammatory golden milk blend! If I had to bake one thing for the rest of my blogging career, it would likely be cinnamon rolls. They are the comfort food of my dreams. The recipe that always challenges me in the kitchen but once it is perfected, there is no better feeling. Especially after making paleo cinnamon rolls that didn’t end up as biscuits like they usually do over here. These Paleo Golden Cinnamon Rolls with Chocolate Filling are a bit different than the usual cinnamon roll consistency. They are a bit more doughy and the dough itself was very different than when you bake my Homemade Blueberry Cinnamon Rolls or Healthy Vegan Cinnamon Rolls. We use a mix of three grain-free flours: almond flour, coconut flour and tapioca flour (I do not recommend subs here) and the consistency is very different compared to using gluten-free oat or spelt flour. When baking them, don’t feel discouraged if the dough isn’t rolling perfectly. My certainly didn’t but I pressed extra dough on the sides and they still turned out so good! 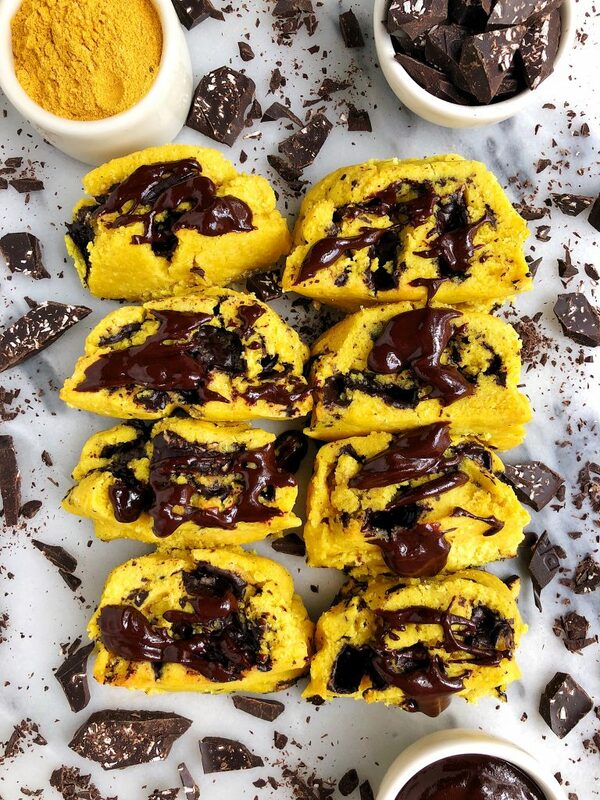 Let’s chat about the color of these Paleo Golden Cinnamon Rolls with Chocolate Filling though. You guys have likely heard of golden milk by now and one of my favorite brands, Garden of Life, just came out with mykind Organics Golden Milk Powder. AKA everything you want to add to your milk for golden milk is ready to go.It is Certified USDA Organic, Non-GMO Projected Verified and all the herbals are grown without toxins, pesticides, herbicides and any of that gross ISH. The mykind Organics Golden Milk Powder is made with organic turmeric root, coconut water powder, tapioca fiber, cinnamon bark, ashwagandha, cardamom and black pepper. The flavor is out of this world. I made it just as a beverage with heated coconut milk and it hit the spot. It is anti-inflammatory, great for recovery and nourishment and even has probiotics. Definitely check out Garden of Life’s new herbals line over on their site (they even have elderberry syrup!!) after baking these Paleo Golden Cinnamon Rolls with Chocolate Filling. 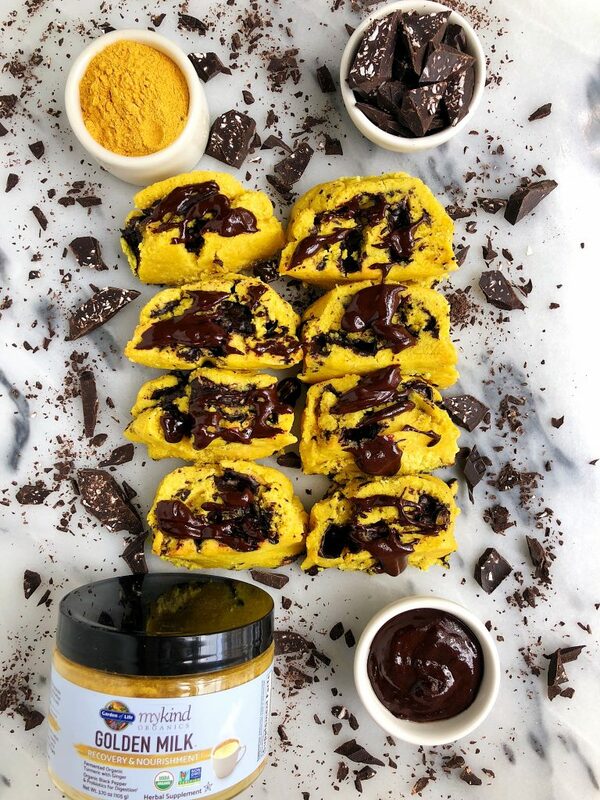 If the thought of golden milk is kind of scaring you, just know there is a dark chocolate filling and nothing with dark chocolate filling is ever “meh” ;-). Grease an 8x8 baking dish with parchment paper and slice the cinnamon rolls 1 inch thick then place on dish and bake for 20-25 minutes and enjoy! Store on counter for 5 days in airtight container or freeze for a couple months! Thank you Garden of Life for sponsoring this post! It means so much to me to work with brands I love and believe in!